I will describe Linux ext4 file system as simple and as comprehensive as possible with examples. Disclaimer: I am not an expert on ext4. Although I aim to make this article comprehensive enough to understand how ext4 works, I have omitted many features, so it is not a full description. I named this post a “Minimum Complete Tutorial”, because I will try to keep the content minimal by omitting the optional parts and extra features while completely describing everything in a fully functional ext4 file system. ext4 is not very simple, you probably need a few hours to go over everything written in this post. I did not execute the examples in this Tutorial in order, and because the file system is very dynamic, there can be inconsistencies between sections or if you try to do it yourself and compare your results to the one I show in this post. However, this does not affect anything in terms of understanding how it works. While writing this post, I have used the Ext4 Disk Layout documentation, the source of ext4 file system (in Linux Kernel), the source of e2fsprogs package (includes debugfs and dumpe2fs) and the source of coreutils package (includes ls). ext4 is the default Linux filesystem since 2010. It is the successor of ext3 which is the successor of ext2. ext means extended filesystem and if you wonder, yes, there is also ext (v1, without any number in the name) but it was used for a very short time (around 1992) and ext2 replaced it very quickly. ext3 is introduced around 2000 with journaling support. If you are using Linux, you are probably already using ext4 as your main file system. However, it is the best to have a play area, so I will create an ext4 file system on a USB memory stick, attached to /dev/sda. First, I have created a GUID Partition Table (GPT) with a single Linux partition on it. If you are not familiar with GPT and Logical Block Addressing (LBA), I recommend you to read my post about GPT first: A Quick Tour of GUID Partition Table (GPT). Warning ! Be very very careful using fdisk and mkfs, and make sure the device you are writing to is the one you do not have any important data. The logical block size is 512B . The partition starts at Logical Block 2048 and ends at Logical Block 31266782. Lets create the file system. mkfs, make file system, creates a file system whose type is specified with -t, here ext4. mkfs is actually a wrapper and actually executes mkfs.<fs> so here mkfs.ext4 does the job. A filesystem is created consisting of 3908091 blocks. Block size of 4096B is the automatically selected value, we can create with another block size also. This block size is not the logical block size (of LBA), it is the file system block size, and ~4M blocks mentioned above are the file system blocks not Logical Blocks. There are 977280 inodes. We will see what an inode is. Filesystem UUID is the partition UUID in GPT. There is something called Superblock with 9 backups. There are things called group tables, inode tables and journal. There is something called accounting information. I have actually looked up to source code of mkfs for this, and it actually only writes out the information for the file system and closes the structures. So it is not something to be specifically mentioned in this post. I will explain all of these and related concepts in this post. We start with the Superblock, as its location is fixed and it contains the basic file system information. We can dump its contents with dumpe2fs and -h option prints only the Superblock. There are plenty of information here and I will explain most of it. The most basic storage layout concept of ext4 is Block. ext4 allocates storage in a series of blocks, just like LBA. However the ext4 Block size can be different. Block size in Superblock is 4096B = 4KB. There are Block count, 3908091, number of blocks in this filesystem. The second basic storage layout concept of ext4 is Block Group. Blocks per group number of contiguous Blocks are organized into Block Groups, and in our file system it is 32768 = 32K. there is one more with less than 32K blocks. So we have 120 Block Groups each containing 32K Blocks (except the last one), and each block is 4KB, and since each logical block is 512B, this means each block contains 8 logical blocks. This is the basic organization of ext4 on the storage, and see the figure below for a visual summary. Superblock, contains information about the file system. It is one block and the first block. Group Descriptors (or Group Descriptors Table or Block Group Descriptors or Block Group Descriptors Table), contains the location of where the Data Block Bitmap, inode Bitmap and inode Table are in a Block Group. So there are as many Group Descriptors as number of Block Groups. Depending on the number of Block Groups, it is one or more blocks. It always follows the Superblock. Reserved Group Descriptor Table (GDT) Blocks. When you first create the file system, these blocks are reserved for future expansion of the file system, since ext4 file system can be enlarged later. Future expansion means more Blocks and Block Groups, so there will be a need for more Group Descriptors. It is zero or more blocks and always follows the Group Descriptors. resize_inode filesystem feature indicates there are reserved blocks for filesystem expansion. Data Block Bitmap, indicates which data blocks are in use. It is one block. Its location is not fixed, it is indicated in the Group Descriptor. inode Bitmap, indicates which entries in inode table are in use. It is one block. Its location is not fixed, it is indicated in the Group Descriptor. inode Table, contains inodes (inode structures). Inode is basically a data structure for every file and directory. It is one or typically more blocks. Its location is not fixed, it is indicated in the Group Descriptor. Data blocks, keep the actual contents of the files. It is one or typically more blocks. It is basically all other blocks in a Block Group. As expected, each bit in (Data Block and inode) Bitmap, indicates the usage of one data block or one entry in inode Table. Since a Bitmap is one block and one block is 4KB so 32Kbits, there can be maximum 32K blocks in a Block Group — which is already the case. Also, there can be a maximum of 32K inodes in a Block Group, but we have only 8144, Inodes per group, now. Reserved GDT blocks: 954, number of blocks reserved for future expansion of the filesystem. Inode blocks per group: 509, size of inode Table in each block group. This number is connected to two other numbers. Inode Size, 256B , and there are, Inodes per group, 8144 of them, so 256B * 8144 / 4096B = 509 blocks per group for inodes. You may think now we know all about the layout of the ext4 file system, but we still do not. It is important we look into two Filesystem features (see Superblock), sparse_super and flex_bg which affects the layout. Since the Superblock contains important information, and losing it results in a complete failure of the file system (you cannot read the filesystem if you do not know the parameters I mentioned above), it has backups (or in other words there are redundant copies of it) in every Block Group. However, this can be too much. In our example, which is a small file system, do we need 120 backups ? So sparse_super feature indicates the redundant copies of the Superblock are only kept in a few block groups, specifically with block group number 0 (which is the primary copy) and if block group number is a power of 3, 5 or 7.
sparse_super also affects the Group Descriptors . By default, Group Descriptors is present in every Block Groups like the Superblock. If sparse_super is present, it is only present in the Block Groups containing the redundant copies of the Superblock as calculated above. We can assume the Superblock and Group Descriptors stay always together. The other filesystem feature we will look is flex_bg which means Flexible Block Groups. This feature is added with ext4. Flexible Block Groups are basically another level of organization over the Block Group, where a Flexible Block Group contains a group of contiguous Block Groups, basically aggregating the data block bitmaps, inode bitmaps and inode tables of all block groups in a flexible block group into the first block group. If we look at the Superblock, Flex block group size is 16. So 16 contiguous Block Groups are packed into a Flex group, and the first Block Group in each Flex Group will contain the data block bitmaps, inode bitmaps and inode tables of all Block Groups (0..15). so there is one more with less than 16 Block Groups. 8 Flexible Block Groups. The last Flexible Block Group contains only 8 Block Groups (112, 113, 114, 115, 116, 117, 118, 119). Note: There is also a meta_bg file system feature which we do not have here. Meta Block Groups can organize Block Groups differently. Type 1a (Block Group 0, if Block Size = 1024B): Block 0 is marked as used and not used (so first 1024B are not used). Block 1 contains the primary Superblock, then many blocks of Group Descriptors and Reserved GDT Blocks follows; then same as Type 3. Type 1b (Block Group 0, if Block Size > 1024B): First 1024B of Block 0 is padding and not used. Block 0 contains primary Superblock (after offset 1024), then many blocks of Group Descriptors and Reserved GDT Blocks follows; then same as Type 3. 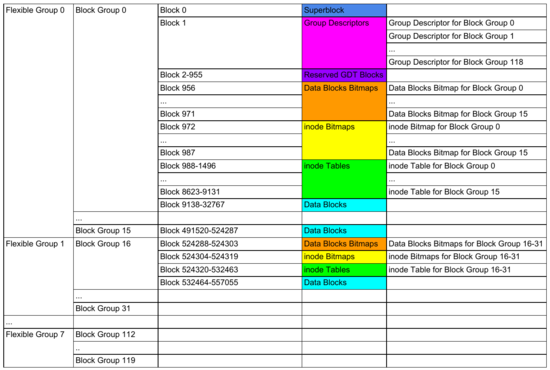 Type 2: Block Groups containing backup copies of Superblock and Group Descriptors. Block 0 is Superblock, then many blocks of Group Descriptors and Reserved GDT Blocks follows; then same as Type 3. Type 3: Block Groups not containing backup copies of Superblock and Group Descriptors. They may contain Data Bitmap(s), inode Bitmap(s), inode Table(s) and Data Blocks. The location of Bitmaps and inode Table is indicated in the Group Descriptor, so the order may not be like this. The first 1024 bytes in Block 0 can be used for boot code, that is why it is not used in ext4. $ sudo dumpe2fs -h /dev/sda1 | grep "First block"
we can see the Block 0 is completely discarded. As far as I understand, there is no other use of this value, it is either 1 or most of the time it is 0. When we have Flexible Block Groups, we can have sub groups of each types since only the the first block of Flex Group contains the Bitmaps and inode Table. So I will name them like Type 2-head and Type 2-rest. Type 1 is always head since it is always Block Group 0. Also, Type 2-head Block Group is impossible. Because the number of a Block Group with a backup should be a power of 3, 5 or 7 (so an odd number) and it has to be divisible by the number of Block Groups in a Flexible Block Group, which in turn can only be a power of 2 (so an even number), and a number cannot be both odd and even, so there is no such number and Type 2-head is not possible. Now we know all about the layout of Block Groups and Blocks of our ext4 file system. We can actually dump information about all of the Block Groups with dumpe2fs. The dump file is long since it contains information for every Block Group (120 of them). I will show you only a few, one from each type. It contains Blocks 0–32767, since each Block Group contains 32K blocks. It contains Superblock at Block 0. It contains Group Descriptors at Block 1 (and only 1). It has Reserved GDT Blocks, Blocks 2 to 955. It has the Data Block Bitmap at Block 956, Inode Bitmap at 972. You will see soon why Inode Bitmap is not at 957. It has the inode table at Block 988 to 1496. There are 1496–988+1=509 Blocks as indicated in Superblock. +1 is because 1496 is inclusive. You can also find these indices directly without using dumpe2fs. The Block Group Descriptors starts from the second block, so dd bs=4096 skip=1. First three 32-bit numbers are Data Block Bitmap, inode Bitmap and inode Table locations. Block Group 0 is Type 1b (head) in my categorization. It has a backup copy of the Superblock, since 1 is a power of 3 1 = 3⁰ . Since it has the backup copy of the Superblock, it also has Group Descriptors and Reserved GDT blocks. It actually contains no Data Block, no inode Bitmaps and no inode Table. They are referenced to Block Group 0 (e.g. Data Block Bitmap of Block Group 1 is at bg #0 + 957) because Block Group 1 and 0 is in the same Flexible Block Group. Same is true for inode Bitmap and inode Table. This is the reason why the Data Block Bitmap and inode Bitmap is not consecutive in Block Group 0, former starts at 956, latter starts at 972. This is 16 Blocks because it contains the information from all other Block Groups (from 1 to 15) in the Flexible Block Group. Similarly for inode Table, which has a size of 509 blocks as indicated in the Superblock, from Block 988 to 9132, there are inode Tables of Block Groups 1 to 15. It puzzled me and maybe you also wonder, in Block Group 0, why does the inode Table end at 9132 but free blocks start at 9138 ? Blocks 9132-9137 are actually data blocks and in use, so nothing strange is going on. If you repeat this example, you may get different output, since I was playing with the filesystem while writing the post. So conceptually, it is not correct to say data blocks follow these metadata structures. Instead, it is correct to say all blocks are data blocks, but some are used for metadata. The ones used for metadata is also marked as used in Data Blocks Bitmap. Block Group 1 is Type 2-rest in my categorization. It contains the backup, but it is not the first Block Group in Flexible Block Group. It contains no backup Superblock, so no Group Descriptors and Reserved GDT blocks. Its Data Block Bitmap, inode Bitmap and inode Table is in Block Group 0, as same as Block Group 1. Block Group 2 is Type 3-rest in my categorization. It has no backup, and it is not the first Block Group in Flexible Block Group. It has the Data Block Bitmaps, inode Bitmaps and inode Tables for all other Block Groups (16–31) in this Flexible Block Group. Block Group 16 is Type 3-head in my categorization. It has no backup, but it is the first Block Group in the Flexible Block Group. There are a few flags we see above. These are used to reduce the mkfs time by not initializing / zeroing some of the structures. INODE_UNINIT: inode Bitmap is not zeroed, because it can be calculated on-the-fly (e.g. no inodes are used so all of them are free). ITABLE_ZEROED: inode Bitmap is zeroed. BLOCK_UNINIT: Data Block Bitmap is not zeroed. (e.g. no data stored so all of them are free). This feature is set with filesystem feature uninit_bg, see Superblock. See below for a visual summary. Each row is a Flexible Block Group, each cell is a Block Group. Remember the backup copies of the Superblock are in 1, 3, 5, 7, 9, 25, 27, 49 and 81 , and only the first cell (first Block Group in a Flexible Block Group) contains the Data Block and inode Bitmaps and inode Tables. 64-bit: You may wonder what happens if the location/index numbers (e.g. the locations in the Group Descriptor) reach to 32-bit maximums. It is not the case with this example, but if you have a large enough storage (probably with number of blocks > 2^32), then ext4 uses the 64-bit mode so important numbers become 64-bit. Flexible Groups, Block Groups and Blocks with their contents. Color codes are not same as previous figure. Now lets talk about inode. Every file (and directory, and symbolic link, and a few others) in ext4 is associated with an inode, which is basically a structure keeping metadata about the file. Lets mount the filesystem and create a file and a directory. The -i flag for ls prints the inode numbers on the left. The lost+found directory is created automatically by mkfs. 2 drwxr-xr-x   4 mete mete  4096 Aug 23 14:56 . 3932162 drwxr-xr-x 104 mete mete  4096 Aug 23 14:59 ..
Root “.” is at inode 2. Lets look at testdir. 521217 drwxrwxr-x 2 mete mete 4096 Aug 23 14:56 . 2 drwxr-xr-x 4 mete mete 4096 Aug 23 15:05 .. It is interesting. “.” as we know current directory, is a hard link (why? because it has the same inode number) to directory, and “..” as we know parent directory, is also a hard link to the parent directory. I will explain more later but basically this directory has two entries, one pointing to the inode of the current directory, other pointing to the inode of the parent directory. Another way to find inode information is with stat utility, which gives more information also by reading the inode and you can run it with the name of the file or directory also. So the testfile is in inode 12. inode keeps information about the type of the file. For testfile, we see it is a regular file. If you ever need, it is possible to modify the inode structure with debugfs set_inode_field command. Now, lets see the inode of the current directory which is the root of the filesystem. A better way to see inode structure is with debugfs tool. Type: directory. We know it is the file system root. Size, in bytes: 4096B. This is actually because it points to a data block and a single data block is 4KB. Links, Hard Link Count: 5. More about this later. Change (ctime), Access (atime), Modify (mtime), Creation (crtime) Times. When we execute an ls command, it basically finds the information of the current directory and prints the files/subdirectories it contains. How ? 2   40755 (2)   1000   1000  4096 25-Aug-2017 10:51 . 2   40755 (2)   1000   1000  4096 25-Aug-2017 10:51 ..
We see the inodes (2, 2, 11, 12, 521217) and types (2=dir, 2, 2, 1=file, 2). Now lets look at the same information in detail. Which blocks are used by the root directory ? First, as we expect, its size is 4K (last offset is 1000h). Linear Directories, this is the default. Hash Tree Directories, this is used if EXT4_INDEX_FL flag is set in the diretory inode, which is not set in our case. There are actually two types of Linear Directory format. Because filetype feature is set for the file system (see the Superblock), ext4_dir_entry_2 type is used. The difference is it contains the type of the file in the directory entry. I believe ext4 always uses this type for linear directories. record length = 00 0c = 12 bytes, including inode and this one, so 6 bytes are already used. Each entry has to be aligned to 4-byte boundaries, that is the reason for padding. padding = 4036–16 = 4020 bytes of zero. The last entry consumes all the block, that is why the record length is more than we normally expect. Out of curiosity, I created many subdirectories in testdir and then it switches to Hash Tree organization (the directory inode flags include EXT4_INDEX_FL). It is possible to dump this information with debugfs htree_dump. ... It goes many lines like this for every Entry including #372. Lets find the contents directly from the disk. The file is at inode 12. Which data blocks does inode 12 use ? How does debugfs blocks command works ? The data blocks used by an inode is kept in the i_block element of the inode structure. It is 60 bytes. For Symbolic Links, if the name of the target fits to 60 bytes, it is stored here. If not, other methods below are used. If Inline Data feature is enabled, and if the contents of a file is less than 60 bytes, it can be directly stored, not our case. In Direct/Indirect Block Addressing, there are 11 direct, 1 indirect, 1 double indirect, 1 triple indirect (total 15, since 60 bytes / 4 = 15) maps. Indirect means the block at that address is not a data block but another block listing addresses of another address blocks, and it is possible to have one 1, one 2 (double), one 3 (triple) indirections. So with 4K blocks, it is possible to address 11 + 1024 + 1024*1024 + 1024*1024*1024 blocks. However, no address can be 64-bits (since each address is 4 bytes). My understanding is Direct/Indirect Block Addressing was used in ext2 and ext3, but not in ext4 anymore. Extent Tree is used in ext4 and inode has a flag for it (EXT4_EXTENTS_FL, see above). Extent Tree is a tree with a maximum depth 5 and with a maximum branching factor of 2¹⁶ = 64K. It is more efficient than Direct/Indirect Block Addressing, and can address 64-bit block addresses. Extent Tree is used because of the filesystem feature extent is enabled, see Superblock. It is not very easy to follow raw Extent Tree structure since it is a tree, but we can dump it with the help of debugfs. As expected, there is only 1 entry. Lets create a large file and then look at its Extent Tree. I am using fallocate here which only allocates the data blocks but do not write anything on them. If you use dd if=/dev/zero it takes a long time to write zeroes to all data blocks. Now we have a tree of depth=2 (level 0 and level 1). Level 0 is the indirect addressing page, then there are 92 pages with addresses of blocks. As I mentioned above, we have only allocated space, the blocks are uninitialized (Uninit flag). Also, note that 10GB file is addressed with only 2 levels, there can be up to 5 levels. For the symbolic link, I said the name of the target is kept at data blocks. This is the main difference between a hard link and a symbolic link. Hard link is a direct pointer to an inode — just a different name in directory entries — , whereas Symbolic link is an indirect pointer through the name of the file / directory. As you see, actual file is at inode 13. Symbolic link is at a new inode 14. However, hard link is pointing to same inode 13. So it is just a directory entry, it does not have its own inode or data blocks. If you check debugfs stat /t and /hl output, they are same. This is the reason you cannot have an hard link pointing something that does not exists, whereas it is possible to do this with a symbolic link, since it is just a name/path, it can be anything. Hard link has to point an existing inode. What happens if I delete the file or hard link ? Nothing, because there is still another name pointing to the inode. The # of links number in inode is updated accordingly, so until there is no hard link left, the inode is not deleted. File is an inode, at least one hard link and data. Directory is an inode, at least two hard links (one from itself, one from parent), and its directory entries data. Symbolic link is an inode, at least one hard link and a path. Mind bending, but yes, you can have a hard link for a symbolic link pointing to a hard link for file. dir_index: Basically it enables the use of Hash Tree Directory entries. However, the corresponding inode of directory should also have the flag EXT4_INDEX_FL set if it is in use. dir_nlink: Normally the number of hardlinks to an inode is kept in the inode structure, as an 16-bit number. That means there can be maximum 64K hard links to an inode. On the other hand, since all subdirectories of a directory contain the entry “..” for the parent directory as a hard link, it means there can be only 64K subdirectories of a directory. When dir_nlinks feature is present, ext4 does not keep track of this counter for directories, if more than 64K subdirectories is used, when it is the case, it is set to 1. Actually a directory can have a maximum 64K - 2 subdirectories. Since there is always a reference to it from the parent directory, and there is a reference to itself. In case you wonder, deleting subdirectories does not return back the real hard link counting. It stays at 1. Also, it seems there is an optimization and after creating so many subdirectories, testdir has switched to Hash Tree mode. huge_file: If huge_file is not set, the maximum size a file can have is 2³² Logical Blocks. If it is set, but EXT4_HUGE_FILE_FL is not set on the inode, that it is possible to have file size of 2⁶⁴ Logical Blocks (very large number). If also EXT4_HUGE_FILE_FL is set, then maximum file size is 2⁶⁴ File System Blocks. 2⁶⁴ Logical Blocks is already a very large number and I think it is not possible because maximum Extent Tree is smaller, so I am not sure why there is a possibility of such a flag on inode. We know testfile is at inode 12 and its data block is at Block 33724. Lets first look at Data Block Bitmap for Block 33724. It is in Block Group 1 (since each Block Group contains 32768 Blocks), so we should look at the Data Block Bitmap of Block Group 1, which stays in Block Group 0, Block 957. Also, it is the Block 33724–32768=956 in Block Group 1, so we should look at Bit 956 in the Data Block Bitmap, which should be in Byte offset 956 / 8 = 119 = 0x77 at Bit 4. Bit 4 is set, so it is in use. It confirms what we saw in the Data Block Bitmap, next block is empty (Bit 5 = 0), previous block is used (Bit 3 = 1) by a different inode. Now, lets check the inode Bitmap. inode 12 is used but inode 13 should be free. Since each Block Group has 8144 inodes (see Inodes per group in Superblock), this should be in the inode Bitmap of Block Group 0, which starts at Block 972. Bit 11 is set. The inode numbers start from 1, that is why I am looking at Bit 11 not Bit 12. As Bit 11 is set, inode 12 is in use. We see above inode 13 should be free. Lets confirm that with debugfs. As we already found out, inode 13 is free. Now, lets talk about the Journal. For normal functioning of the file system, Journal is not needed. However, for performance reasons, we do not want to write or sync every change to ext4. If the system crashes meanwhile, the changes that are not written to ext4 will be lost. That is where Journal is needed. Every such operation is written to Journal first (not to ext4 first) and it is finalized later (written to ext4 later). If the system crashes, during recovery, probably on the next boot, Journal is replied back to ext4 so changes are applied and not lost. Journal can be used in three different modes. This can be set with the mount option data. journal: All data (both metadata and actual data) is written to Journal first, so the safest. ordered: This is the default mode. All data is sent to ext4, metadata is sent to Journal also. No protection for data but metadata is protected for crash. writeback: Data can be written to ext4 before or after being written to Journal. On a crash, new data may get lost. First, a Descriptor Block is written, containing the information about the final locations of this operation. Second, a Data Block is written. It can be actual data or meta data. Third, a Commit Block is written. After this, the data can be sent to ext4. Other than Commit Block, ongoing operation can be cancelled with a Revocation Block. Also, if a Commit Block is not found, when a replay happens (e.g. crash then recovery), it is not written to ext4. has_journal feature is set, so we are using a Journal. It is a file with mode 0600 meaning it can only be read and written by the owner (which is root, UID=0). Maybe a solution to make Journal visible would be to change the entries of a directory and add inode <8>. To do this, I dumped the inode data of testdir, and manually modified (using hexeditor called bless) it to include inode <8> with name J . Which block do we need to write onto ? Warning ! Be very careful doing this, make sure the device you provide has no data you care about. 521217   40775 (2)   1000   1000      4096 25-Aug-2017 10:51 . 2   40755 (2)   1000   1000      4096 25-Aug-2017 10:51 .. It looks OK. However, if I try to ls, I get an error. I am not sure why, if I am doing something wrong or it is because Journal is special. Let me know if you know the answer. 521217 drwxrwxr-x 2 mete mete 4096 Aug 25 10:51 . 2 drwxr-xr-x 4 mete mete 4096 Aug 25 10:51 .. I have covered the following ext4 topics in this article. I hope this post helps you to understand how ext4 works.